Pure alumina is a refractory material, meaning that it can withstand extremely high temperatures without breaking down. Alumina’s melting point is approximately 3760°F. A form of alumina, aluminum oxide, is frequently used to make crucibles. Aluminum oxide is industrially refined from bauxite ore, which contains aluminum. Following multiple purification processes, a substance called calcined alumina is extracted, which contains mostly alumina with some impurities, primarily sodium oxide. Unfortunately, the less pure the alumina, the lower its resistance to heat. For this reason, high-purity alumina is preferred, especially in industrial laboratories. This type of alumina can be made using a similar process to calcined alumina. The heat resistance of alumina crucibles is an especially important feature because they are used in chemical laboratories as containers for extremely hot chemical compounds. 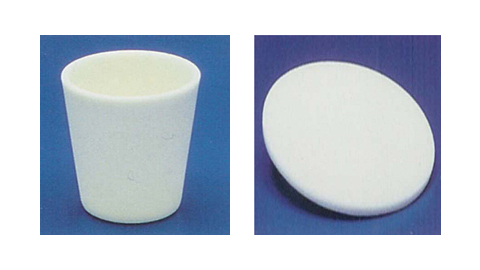 Alumina crucibles have applications in laboratory research, academia and industry and come in a wide variety of shapes and sizes. For example, high-form alumina crucibles are commonly used in academic laboratories. Conical Alumina Crucible and Disc – LSP Industrial Ceramics, Inc. These crucibles, which are often used to melt or heat chemicals over a Bunsen burner or in an oven, look like a deep, narrow cup. 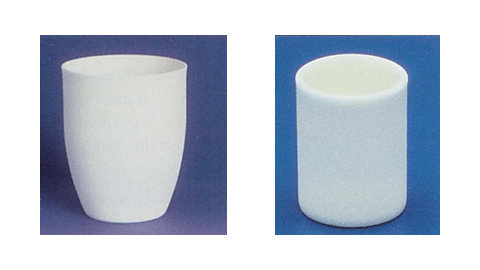 Commercially, high-form crucibles come in rectangular or cylindrical form. Other crucibles used in academic or research laboratories are usually small, with a diameter less than the size of an adult human hand, adequate for the small amount of chemicals they are required to hold. All smaller crucibles are used with a lid made out of the same material, and are handled with tongs and gloves to prevent burning or other accidents. Industrial alumina crucibles, which may be used for melting metals and creating alloys, can be much larger and require installation in the furnace with sufficient space and exterior support for use. Alumina Crucibles An alumina crucible is a type of crucible made from alumina, also called aluminum oxide, which is the same material used to produce aluminum metal. The ceramic form of alumina is frequently employed for production of alumina crucibles because of its strength, low cost and ability to withstand temperatures upwards of 3272°F.